UCF’s Homecoming 2018 week begins Monday, Nov. 5, and will feature six days of events including comedy, fireworks, talent, Sprit Splash, football and basketball games and other activities. Monday, Nov. 5, 8 p.m. – Comedy Knight starring Joel McHale and featuring Jaboukie Young-White and J.F. Harris. Doors open at the CFE Arena at 7 p.m. Students with UCF IDs can pick up free tickets at scheduled distribution sites and times; guest tickets are $25 and available at the CFE box office or Ticketmaster. Tuesday, Nov. 6, 6 p.m. – Movie Knight and basketball game. The UCF men’s basketball team hosts its home opener against the Rider Broncs at the CFE Arena. Afterward, join the screening of Incredibles 2 on Memory Mall. Students can register for game tickets through UCF Athletics. Take your own chair and/or blanket for the movie, where popcorn and drinks are available with student IDs. Wednesday, Nov. 7, 8 p.m. – Knights Got Talent. Students showcase their talents at the CFE Arena. Take student ID for admission. Thursday, Nov. 8, 8 p.m. – Concert Knight with A$AP Ferg featuring Ella Mai. Doors open at the CFE Arena at 7 p.m. Students with UCF IDs can pick up free tickets at scheduled distribution sites and times; guest tickets are $25 and available at the CFE box office or Ticketmaster. 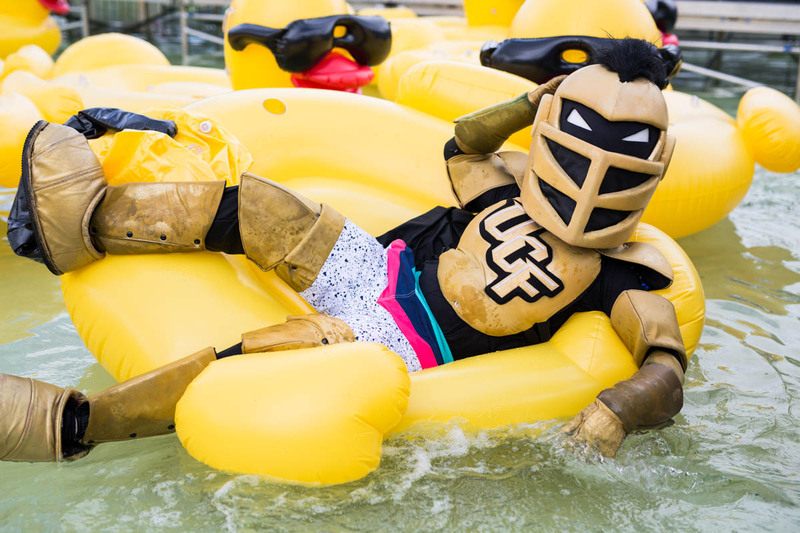 Friday, Nov. 9, 11 a.m. – Spirit Splash, UCF’s greatest tradition, will conclude with a 1 p.m. run-in to the Reflecting Pond. Try to get this year’s exclusive rubber duck. Friday, Nov. 9, 6 p.m. – Fireworks Festival on Memory Mall. Games, food, entertainment. Fireworks will launch at 9 p.m.
Friday, Nov. 9, 10 p.m. – Greek Extravaganza Step Show at CFE Arena, featuring step teams from UCF’s National Pan-Hellenic Council and Bethune-Cookman University. Free entry for students with IDs and children under 10. General admission is $10 and tickets are available at the CFE Arena box office and Ticketmaster. Saturday, Nov. 10, TBA – The Knights football team takes on the Navy Midshipmen at Spectrum Stadium. The team has the nation’s longest current win streak at 21 games. Students can register for game tickets through UCF Athletics.